that, we believe, will be helpful in your Christian walk with Jesus. To Him belongs glory, and honor and praise! love and honor the Lord Jesus Christ. around the world-- through missions. lives. This is our prayer. Our Statement of Faith can be found by clicking here. and also by participating in Bible studies. reading it. 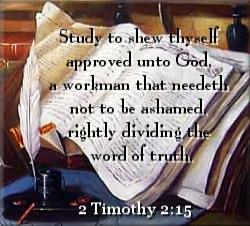 We must all "Study to show thyself approved." of encouragement, please sign our guestbook. We would love to hear from you! any of our pages, please let us know. Thank you in advance. Bible studies, written by popular Bible expositors such as A.C. Gaebelein, C.H. Mackintosh, C.I. Scofield, J.N. Darby, J.H. Brookes, H.A. Ironside, R.G. Lee, and others. us your link for review. May the Lord richly bless you as you serve Him. him in all things, which is the head, even Christ:"